First variable output 4000-8000 gph pump with a wireless remote control. The heart of the ecosystem. The pump circulates the water from the skimmer putting it through the filter mats and sending it over to the bottom of BIOFALLS where it passes up through another set of filter mats and media. Water Garden Pumps are exclusively designed for use in a water garden skimmer. Flow adjusts from 4,000 gph to 8,000 gph with a click of a button on the remote control unit from up to 150' away. Allows you to customize and fine tune the flow of waterfalls and streams. 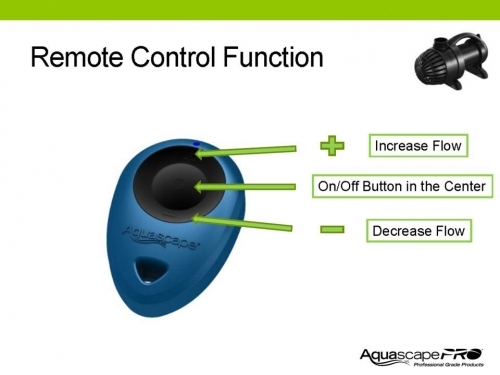 Pump can be turned on or off with the remote control. Ideal for use in Pondless Waterfall applications, allowing the falls to be adjusted or turned on and off when desired. These pumps are ideal for waterfalls and water features that do not require the water to be pumped up to a very high elevation. 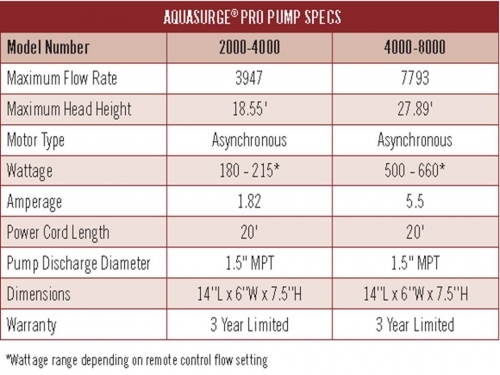 Best efficienty for the 2000-4000 gph pump is between 5' to 12' of head and for the 4000-8000 gph pump is 7' - 15' of head. The asynchronous motor design ensures that the impeller spins in only one direction; maximizing performance, reliability and minimizing electrical consumption. Built-in carrying handles add convenience. Pumps can be used vertically or horizontally. Fish Safe - Uses no oil! Recommended for use in a skimmer prefilter or MicroSnorkel Pondless. All pumps in ADIs' product line are specifically designed to support the demanding requirement for 24 hour/7days a week operating condition of a water garden. Continuous operation heightens the importance of proper pump selection to minimize power consumption yet deliver enough flow to produce the natural sights and sounds of a beautiful water feature. 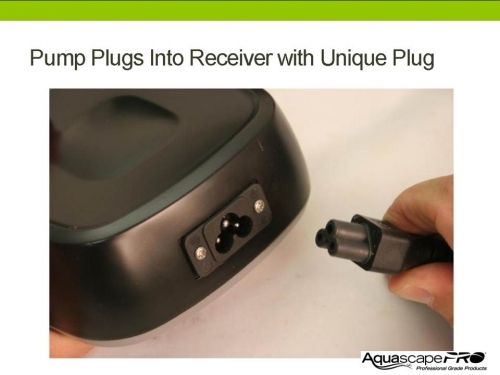 AquaSurge PRO Pumps can be used as a non-submersible, in-line pump with the proper fittings. Care must be taken to prevent solids in the water from damaging the impeller. Also available in smaller size 2,000 - 4,000 gph model. FREE STANDARD SHIPPING ON THESE PUMPS! 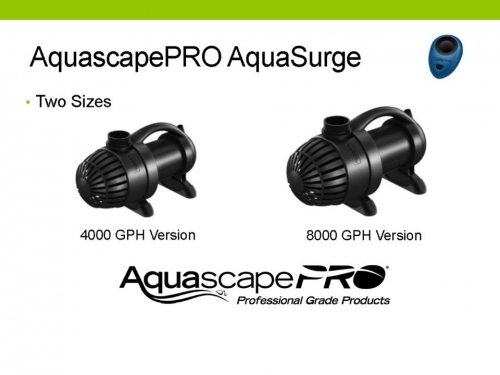 * NOTE *: If you are using the AquaSurge PRO Pump to replace an exsisting AquascapePro Pump (1500, 3000, or 4500 gph) and you have an Aquascape 2" Dual-Union Check Valve, you will need one of two special adapters. For a Classic Series Skimmer (rectangler in shape), you will need the "Classic Series Adapter" (SCU#99144) & a small 4 oz container of "Christy's Red Hot Glue". To view our installation video, "CLICK HERE"
For a Signature Series Skimmer (flat front with rounded sides and back), you will need the "Signature Series Adapter" (SCU#29475) No glue is required for this adapter. To view our installation video, "CLICK HERE"
Choosing a pump for a water garden should be based on a few job requirements. Desired flow, pumping height and electrical costs are all factors that need to be considered. The higher the pump needs to push water, the less flow you are going to get out of that pump. Pond Kits come with pumps sized to turn a pond over at least once per hour. 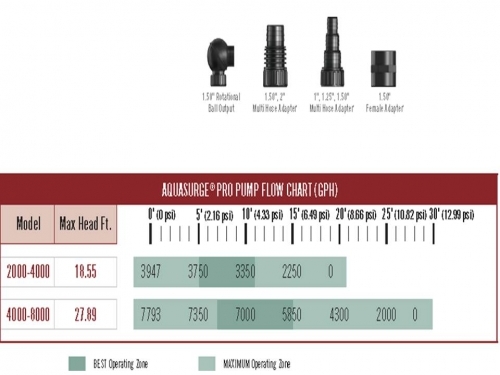 Make sure your pump application follows the same guideline. If your applications' pumping height is close to maximum pump shut off height, substitute the next larger pump available. 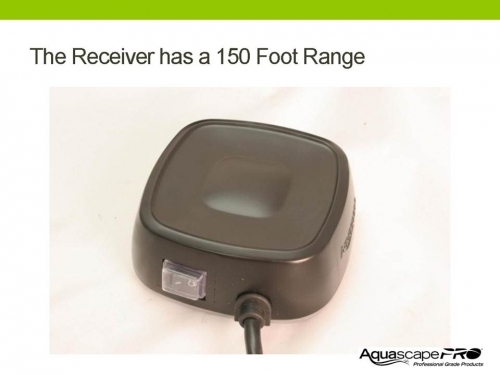 To view the written 12 page AquaSurge Pump Instruction Manual (English & French) in a Down-loadable PDF file that can be printed, click on the link at the end of this statement. 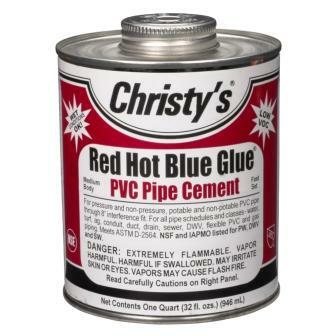 "DOWNLOAD MANUAL"
Cristy's Red Hot Blue Glue for Flexible PVC Pipe Cement for Water Garden & Pond Use – No Primer needed when using this adhesive!